You can turn scanned images into vector drawings, while maintaining the sketchiness of a pencil line or into vector images with a bitmap fill. Both options can add life to an animation, which straight vectorization with smoothing does not usually afford. From the top menu, select File > Acquire from TWAIN or press Ctrl + Shift + S (Windows/Linux) or ⌘ + Shift + S (Mac OS X). Select your scanner from the Scanner list. Click Preview to get a test scan of your drawing. Create Layer: Imports an image into a new layer. Type a name for the layer in the Name field. Add to Existing Layer: Imports the image into an existing layer. Select a layer from the Layer list. Colour: Creates a vector rectange with the bitmap as a texture inside. Black and White: Vectorizes drawings as a solid black line; creates a 100% vector-based drawing. Set the Threshold and Smooth parameters. Threshold: Determines which black, white or grey pixels become a black line. 0% means all the light pixels will be kept as black vector line. A value of 100% means only the very dark pixels become a black line. Smooth: Determines the smoothness of lines. The higher the value, the less angular and bumpt the resulting lines will be. 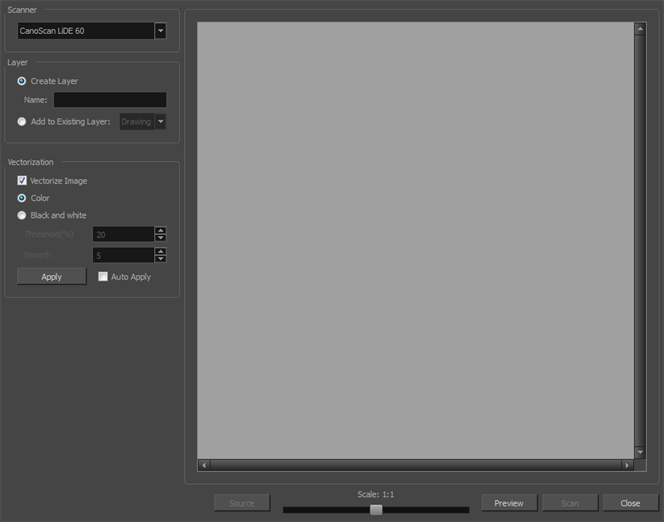 Auto Apply: Automatically applies the colour or black and white settings to the scanned images. Adjust the Scale control and the sliders in the Preview Image window until you're satisfied with the view. Click Scan to import your drawing.